Well, the Belgian-style Pale Ale I brewed a few weeks ago is bottled and resting comfortably in 22-ounce bottles and one giant (1-liter) swingtop. Half the batch is in the de facto beer cellar at my friend Ryan's house and the other half is in my kitchen. It's probably about 67 degrees in the basement and 75 in the kitchen. It'll be interesting to see how these bottles compare and which ones I like more. I'm guessing the bottles kept at the warmer temperature will have more esters. Whether that's a good thing remains to be seen. I'm letting the beer sit at least another week (which will be about three weeks of conditioning) before I crack one open. Meanwhile, I'm waiting on some ingredient from William's Brewing. I'm trying out a new Belgian extract that is 90 percent two-row Belgian Pale and 10 percent wheat. I'll be making a saison with this extract along with perhaps a little bit (5 percent or less) of sugar to enhance the dryness. So far I'm not thinking of adding any spices; just the Wyeast 3724 yeast. I've also purchased some Wyeast 3522 that I'd like to try brewing a Grisette (low alcohol saison) with that would be packaged in a Party Pig or two and maybe some bottles. I've been reading about Grisette, a version of saison, in the book Farmhouse Ales: Culture and Craftmanship in the Belgian Tradition by Phil Markowski. It's a really great book if your'e intrested in brewing saisons or even if you're a fan. 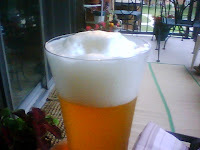 Pictured is my "Saison Morency" from last year. Anyhow, we picked up a mixed case or so of the New Glarus beer. Among our picks was the new version of Coffee Stout, which I'm trying for the first time this evening. I really liked the old version and have high hopes for this one -- that actually has coffee in it! First off, as you can see in the pic, this stout is damn dark. It's a good lookin' stout with a compact off-white, persistent head. There's a whiff of burnt chocolate at first, but then it's pretty much roasted coffee -- quality roasted coffee. The first sip is much thicker than I remember compared to the old version. The taste is predominantly chocolate (more milk chocolate than dark, which is a bit surprising) followed by dry roasted grains and dry cocoa finish. It's pretty full bodied, thick and smooth throughout. The finish is pretty full, but by no means too sweet or cloying; there's the right amount of bitterness coming from hops and roasted grains. 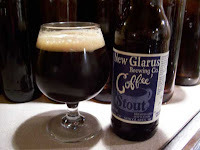 The roasted coffee flavors tend to flourish a little more as the beer warms up to room temperature and the chocolate flavors dominate much less. There was a lot more chocolate flavor here than I thought at first, with the coffee mostly in the nose. I was hoping for a little more coffee flavor, but as it warmed up I liked it more and will happily finish the rest of the six-pack served close to room temperature; just not tonight.